We know it's important to eat fish if you're pregnant, but eating too much could lead to rapid infant growth or childhood obesity, a new JAMA Pediatrics study says. Eating certain types of fish while pregnant can be very beneficial, but an article published in JAMA Pediatrics links high consumption to an increased risk of rapid infant growth and childhood obesity. In 2014, the U.S Food and Drug Administration and the Environmental Protection Agency encouraged pregnant mothers, breastfeeding women and those likely to become pregnant to eat no more than three servings of fish per week. Leda Chatzi, Ph.D., the study author from the University of Crete in Greece, examined data from 26,184 pregnant women and their children in European and U.S studies to investigate a correlation between fish intake and childhood development. High fish intake was considered to be more than three times a week; moderate was more than once but not more than three times per week; low fish intake was once a week or less. They followed up on children at 2, 4, and 6 years of age. Women who ate fish more than three times per week when they were pregnant gave birth to children with higher BMI values at 2, 4 and 6 years of age compared with women who ate less fish. Consuming higher amounts of fish each week was also associated with an increased risk of rapid growth from birth to 2 years, as well as a higher risk of the child being overweight or obese at 4 and 6 years old. Of the children, 31 percent were rapid growers from birth to two years of age, while 19.4 percent and 15.2 percent of children were overweight or obese at ages 4 and 6 years, respectively. The effects of fish intake on rapid growth was greater in girls than boys. "Moderate levels of fish consumption during pregnancy do not seem to confer health risks...they have been associated with improved fetal growth and neurocognitive function in the offspring," Chatzi told Fit Pregnancy. "These benefits would be greater if pregnant women choose seafood low in methyl-mercury and other environmental pollutants." The authors say that environmental pollutant contamination in fish could be the cause of increased childhood obesity. Fish during pregnancy: yea or nay? Which types of fish are less risky? The FDA recommends salmon, shrimp, pollock, light canned tuna, tilapia, catfish, and cod. Chatzi said to avoid raw fish and large predatory fish such as king mackerel, swordfish, shark, and tilefish. Chloe Zera, M.D., an obstetrician at Boston's Brigham and Women's Hospital, says she would be cautious in saying that four servings of fish a week is bad. She would not change her practice, which supports the FDA guidelines. 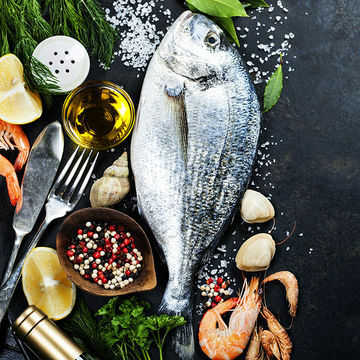 "The bottom line is that this study validates the FDA recommendation...and seems to confirm that this level of fish consumption is safe as well as confirming that more of a good thing is not always better," adds Serena Chen, M.D., director of the Division of Reproductive Endocrinology at Saint Barnabas Medical Center in New Jersey.